Sub-Saharan Africa has a huge opportunity to grow more food through sustainable agriculture. This essay explains how seizing this moment will create wealth for farmers through expanding markets and trade, and benefit consumers through lower cost, better quality and more diverse food products. Africa should take the lead in forging a new African-made “Green Revolution". Sub-Saharan Africa stands at the threshold of a transformative agriculture opportunity, thanks to its patrimony of plentiful land and water resources, as well as its large and growing labor force. What is the key to crossing that threshold? Africa now earns an average of 24% of its annual growth from its farmers and their crops. 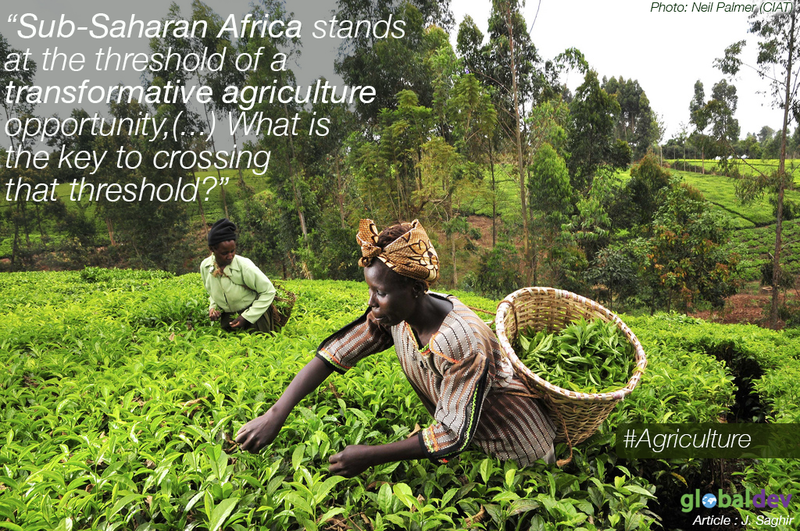 Agriculture and agribusiness together account for nearly half of Africa’s GDP. The continent has nearly half of the world’s fertile land that is yet to be brought under cultivation – around 202 million hectares of arable land that is non-protected, non-forested and with low population density. While some areas of the continent are hyper-arid, arid or semi-arid, Africa’s bountiful water resources are underused on average. Sub-Saharan Africa currently uses only 2-3% of renewable water resources, compared with 5% worldwide. Too much of the food consumed in Africa is imported, denying opportunities for local producers and causing a drain on scarce foreign exchange. This presents a huge opportunity to grow more food through sustainable agriculture and feed Africans with better quality, more nutritious food. It also presents an opportunity to create wealth for farmers through expanding markets and trade, and to benefit consumers through less expensive, more diverse food products. Africa’s agriculture and agribusiness sectors should be transformed. This is potentially one of the most important growth opportunities for entrepreneurs in emerging Africa. Thailand has less than 10% of sub-Saharan Africa’s population but exports more food products than all African countries combined. Brazil’s food exports are 150% higher than Africa although they were similar in the 1980s. African farmers have the lowest farm productivity; their grain yields are only half of those achieved by Asian or Latin American farmers. The transformation of agribusiness won’t happen unless all stakeholders get involved. Governments need to work with farmers and agribusiness, making it easier to raise capital from banks, increasing investment in infrastructure that connects farms to markets, bringing irrigation to more drylands, rethinking policies that restrict growth and competition, boosting regional trade, and fostering good policies that unleash creativity and innovation. So what is holding Africa back? Attention needs to be focused on binding constraints that hold a particular sector from achieving its full potential. Irrigation is critical to increase and stabilize production, reduce risks, and provide the basis for higher value agriculture. Underinvestment in irrigation is one of the reasons why the Green Revolution that transformed agriculture in the tropics of Asia and Latin America bypassed Africa. Other factors also had a role to play – more heterogeneous production environments, inadequate research capacity, lack of technology, poor policies, and weak institutions – but the inability of farmers to irrigate their crops stands out. Nothing grows without water. The opportunity is huge for achieving transformational impact by bringing more irrigation to parched lands. But along with the opportunity come a number of challenges. Water resources are available, but they are not limitless. Agriculture is the largest user of the world’s freshwater resources: 80-90% of fresh water withdrawals are used to irrigate crops and grow food. Agriculture is also a notoriously inefficient user of water. By employing modern irrigation techniques, including drip irrigation and micro irrigation, it will be possible to reduce water use sustainably for growing food crops, meet the threats posed by climate change, and reduce agriculture’s environmental footprint through “climate-smart” agriculture. Significantly increase agricultural productivity growth. Ensure deployment of more climate-smart agriculture practices. Improve gender equality and increase the productivity of women farmers. Link farmers to markets and strengthen value chains. Give access to means for entrepreneurship. Enhance the resilience of people and incomes. African governments, the private sector and the international community should take the opportunity in the next few years to forge the next generation of public-private partnerships needed to bring about transformational change in agriculture and agribusiness. Africa should take the lead in forging a newGreen Revolution. Jamal Saghir is Professor of Practice at the Institute for the Study of International Development at McGill University, Montreal, Canada.